The New Zealand National Institute of Water and Atmospheric Research has been examining the changes in volume and snowline on New Zealand Glaciers since 1977. This survey has concluded for 2011 and 2012 that the snowline has been too high for glacier equilibrium, the glaciers are shrinking. The Tasman Glacier is evidence of this draining from the highest mountains in New Zealand. For Tasman Glacier the retreat has been ongoing, the NIWA has noted a retreat of 180 m per year on average since the 1990’s. Dykes et al (2011) note a maximum depth of 240 m, and an expansion of 0.34 square kilometers per year in area. 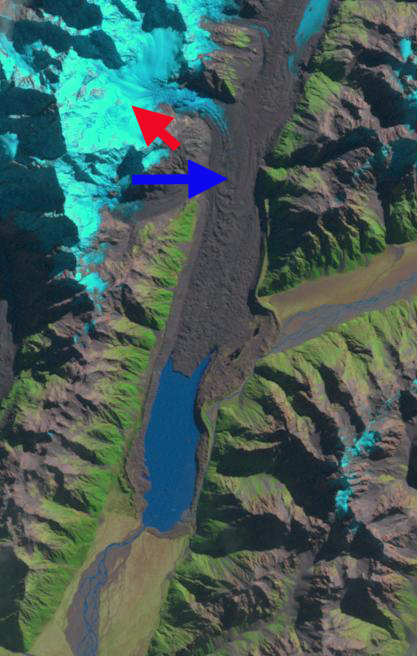 The proglacial lake at the terminus continues to expand as the glacier retreats upvalley. The lake is deep with most of the lake exceeding 100 metes in depth, and the valley has little gradient, thus the retreat will continue. It has been noted by researchers at Massey University that the lake can expand in this low elevation valley another 9 km, and that at the current rate this will occur over two decades. 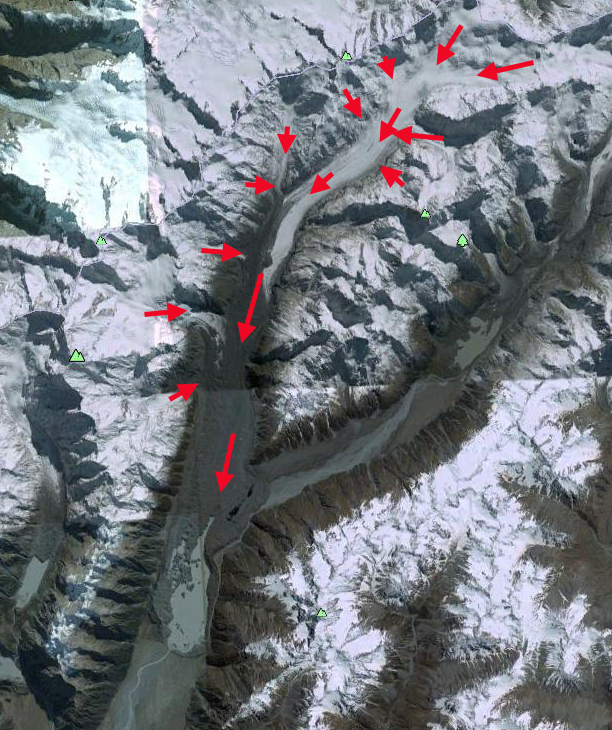 This post is an update to the Tasman Glacier Retreat post of 2009 updated in 2011. 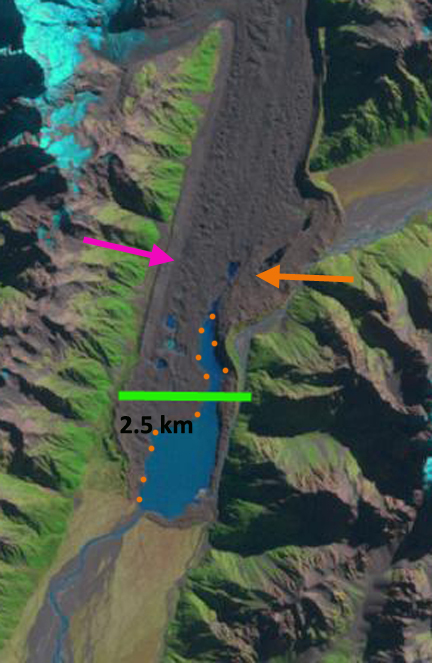 Imagery of Tasman Glacier indicates the future it faces. There was no lake in 1973 and now it is more than 5.5 km long across a width of about 2 km, and 7 km long at its longest point. Here we examine four images, the 1972 topgographic map, 2000, 2012 and 2013 Landsat images and 2006 Google Earth imagery. In each image an orange and a pink arrow indicate the 2013 terminus on the east and west respectively. 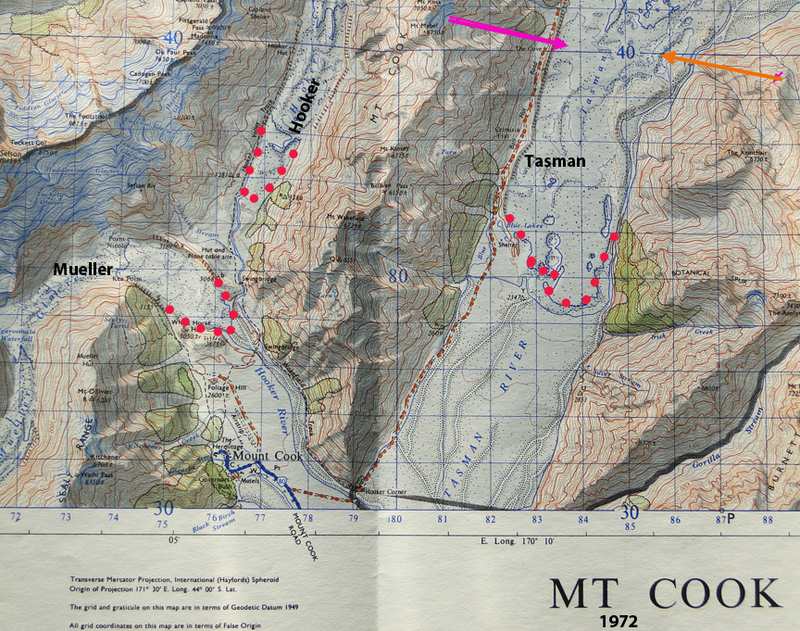 In the 1972 map there is no lake at the terminus of the Tasman Glacier. 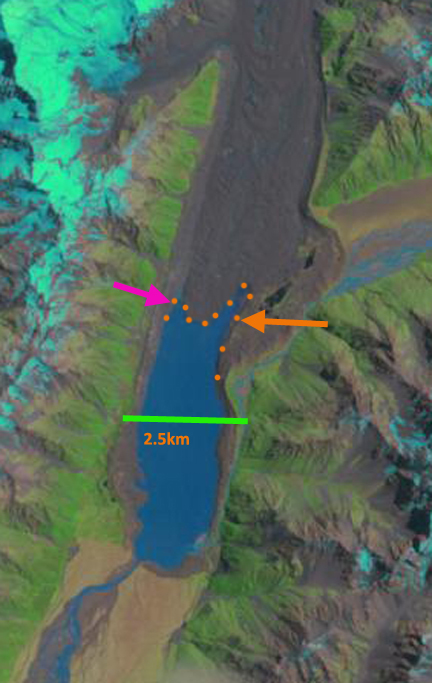 In 2000 the Tasman Glacier lake was 2 km long on the west side and 4.5 km along on the east side. By 2006 the lake has expanded 2.5 km on the west side and 5.5 km long in a narrow tongue on the east side. By 2013 the Lake is 5.5 km long from bank to bank. 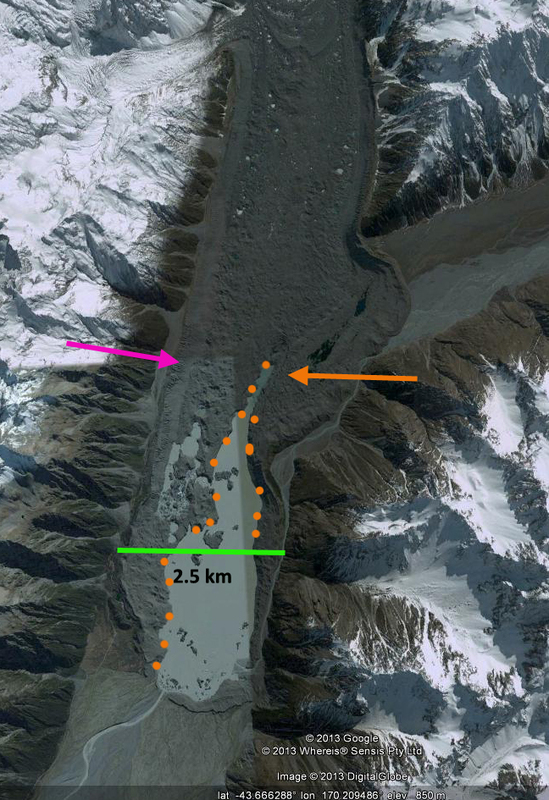 The glacier has experienced two larger calving events in recent years the first triggered by the Christchurch earthquake in February 2011 and the second on January 30, 2012. Such events can occur because the terminus has thinned to the point that the glacier terminus is more buoyant and crevasses and rifts extend through the thinner ice. This entry was posted in Glacier Observations and tagged New Zealand glacier retreat, Tasman Glacier retreat. Bookmark the permalink. Thank you for the great images. Great post! The statistics in the article I derived. There is a link to Dykes work which is the published work on this you can cite, but the focus there is the lake itself. Dykes I am not sure is still at Massey.